Society of the Sword Now in Audio! The Society of the Sword trilogy is now available in audio. Derek Perkins narrates this trilogy, giving it a slightly different flavour to the Wolf of the North, but does an equally superb job, and makes this setting his own. If you’ve enjoyed any of my books, audio or otherwise, I think you’ll really like this one. It’s all three parts in one volume, so you can binge through the entire trilogy in one go! I’ve been particularly looking forward to this release, as enough time has passed for me to forget a lot about Society of the Sword (Wolf of the North is still a bit recent for me to revisit it! ), so I get to listen to it as close to fresh as it can be when you’re the one who wrote it! Ok, I had an email recently reminding me about the Ostenheim City Guide that I was planning to do a while back. I have to admit, with all the work that's been going into getting the entire Wolf of the North trilogy put together, I completely forgot about it! I've dug out the old file, and instead of putting it up as a complete booklet - at least initially - I'm going to post instalments of it here on the blog. I'll be getting on to that over the next week or so. In other news, the first part of The Wolf of the North trilogy will be going off for line edit shortly, as soon as I've made a few slight changes, so things are well on track with that. My Christmas viewing revolved around a few box sets and some stuff on Netflix. First off was an A/B session of ‘Borgia’ and ‘The Borgias’. Coming to the European-made Borgia from the US-made The Borgias was a bit jarring, and initially I wasn’t at all impressed with the former. I like Jeremy Irons as an actor, and think he’s one of those actors who has gravitas to burn. However, after a few episodes, I thought John Doman—despite an American accent I gather a great many viewers were put off by—was far better suited to the role of Rodrigo Borgia/Pope Alexander VI. As my esteem for him grew, so to did my opinion of Borgia as a whole. The supporting cast were excellent, if they can be called that. Any of the major parts, from Cesare and Lucrezia to Alessandro and Giulia Farnese, could be considered leading players. Across the board, I thought the actors in Borgia were far stronger, and far better suited to the parts they played. Both shows portrayed the period well, although once again I felt Borgia got it a bit closer to the mark. I like watching shows like this in an attempt to immerse myself into that atmosphere, as it is, broadly speaking, the period that the Middle Sea world is set in at the time of The Tattered Banner and The First Blade of Ostia. My inspiration files for weapons, clothes, and architecture are filled with pictures of things from the 1450-1650 period. Overall, I think both series are worth watching, but if you only have time for one, I’d go with Borgia. This is the area of history that most interests me, and I can definitely see myself watching Borgia again in the not too distant future. I also watched the new Netflix show ‘Marco Polo’ which I really enjoyed. We go from an area of history that I know quite a bit about, to one I know very little about. I’ve not made anything more than a cursory reading of Asian and Mongol history, which is something I’m going to have to rectify this year, as it really is fascinating. A very good show, with solid acting across the board—I thought Benedict Wong playing Kublai Khan was particularly excellent—and one which I’m eagerly anticipating the second season of. I have the first season of the recent BBC version of The Three Musketeers next in the queue, which I’m looking forward to. I’ve mentioned before I think that The Three Musketeers is one of my favourite stories, so I’m interested to see what they do with it. From the bits I’ve seen, it looks pretty encouraging. As a reminder, there are still signed copies of The First Blade of Ostia up to be won over on Goodreads. You can enter the competition by clicking here. Well, I hope everyone had a great Christmas, and is having a very happy new year! The First Blade of Ostia available in paperback! The First Blade of Ostia is now available in paperback. I recently received my proofs and I have to say I’m pretty pleased with how it’s turned out. Of my covers so far, I think this one is my favourite. As usual, I’ve included the paperback in Amazon’s matchbook program, which means if you buy the paperback, you get the Kindle version for free. To mark the arrival of the paperback, I’m also running a giveaway over on Goodreads to win a signed copy. You can enter it here. Don’t forget there’s still a giveaway running for signed copies of The Tattered Banner, which you can enter here. Otherwise, I hope everyone is all set for Christmas, and you all have a really great holiday! The map was drawn up by the very talented Robert Altbauer. You can see more of his work at his website. I can’t express how delighted I am with his work – it’s a great experience to finally see the image that’s been in my head for such a long time. We chose a style similar to the Renaissance era city maps from books like Civitates Orbis Terrarum; something that looks like it was created at the time it is set in, rather than a modern map of an old city. 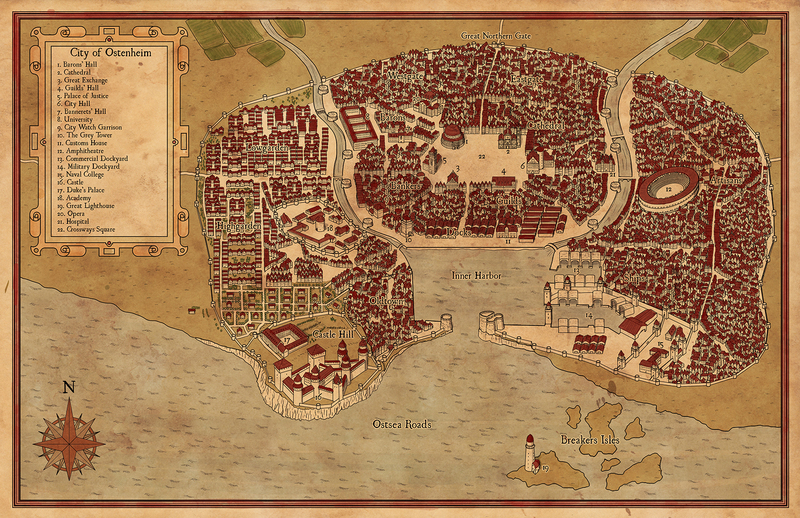 The map will be a great accompaniment to the series of posts about the city that is upcoming, and will make my job of explaining where all the important buildings are a lot easier! I considered doing the whole thing in this style, but reckon it will be easier to read by putting them in regular blog posts. It will also be delayed a little longer as I’ve something else coming down the pipeline which will be taking pride of place next week, but more of that anon! I mentioned in my last post that I was putting together a tour guide for Ostenheim. It’s progressing well, but still needs a little more work – I want to finish the whole thing before I start posting it up. I have however done up a cover for it, which I’m posting now. The first part should be online next week (I hope!). I hope everyone’s well and enjoying the last few days of summer.